Enforcement activity by the Consumer Financial Protection Bureau tailed off sharply in the second quarter, with no crackdowns against a bank. 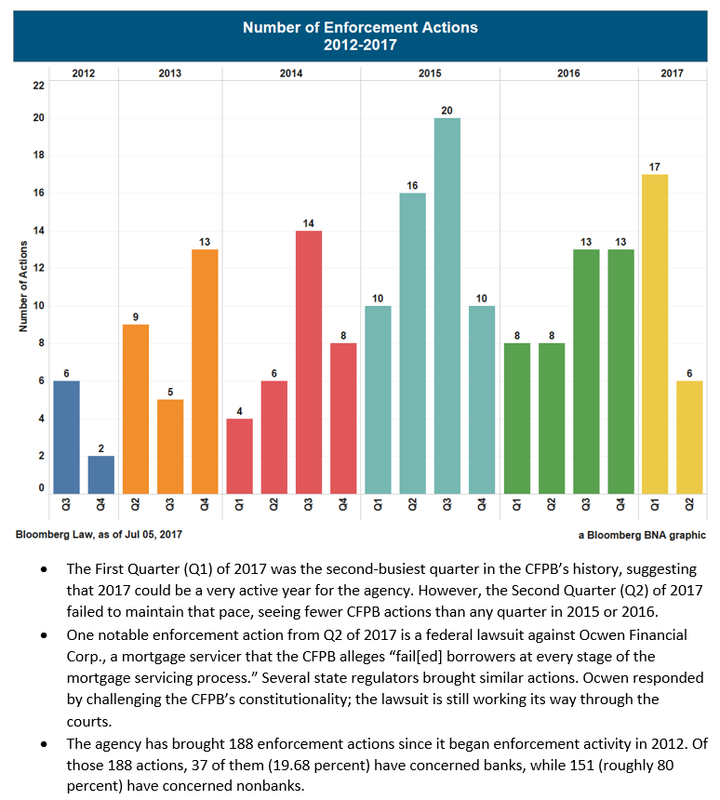 CFPB enforcement actions fell to six April through June, compared to 17 in the first quarter of 2017, according to Bloomberg Law’s CFPB Enforcement Tracker and CFPB Enforcement Analytics. The first three months of the year marked the second-busiest quarter in CFPB history, signaling 2017 could turn out to be very active for the bureau. But the second quarter saw fewer CFPB actions than any quarter in 2015 or 2016. Gerry Sachs, of counsel at Paul Hastings LLP in Washington, said he thinks the bureau pushed a lot of enforcement actions to resolution just after the election. Last year, CFPB enforcement activity picked up in the latter half. The bureau took 16 actions during the first six months, while there were 26 crackdowns announced July through December. Lately, the agency’s actions have been for rather small sums. At the end of the second quarter, it announced cracking down on credit repair companies for allegedly charging illegal fees and misleading customers. The affected parties agreed to pay around $2 million to settle the charges. The level of enforcement against banks is far less aggressive than in the past, according to a tracking of the bureau’s activity. The agency brought 188 enforcement actions since it began enforcement activity in 2012. Of those 188 actions, 37 of them — or 19.7 percent — have concerned banks, while 151— or roughly 80 percent — involved nonbanks. Yet in the first six months of the year, only one enforcement action was taken against a bank. The bureau announced in January it was suing TCF National Bank for allegedly tricking consumers into costly overdraft services. A notable enforcement action in the second quarter was an April lawsuit against Ocwen Financial Corp., a mortgage servicer, for allegedly making widespread errors and illegally foreclosing. The CFPB said Ocwen botched basic functions like sending accurate monthly statements, crediting payments and handling taxes and insurance from escrow accounts. But the company has pressed back on the CFPB over the suit, challenging whether the bureau is unconstitutional. PHH is a New Jersey mortgage company that challenged a $109 million disgorgement order by CFPB Director Richard Cordray in 2015. PHH sought review and a federal court panel ruled in its favor last October.